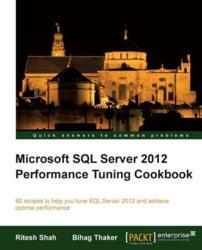 Packt is pleased to announce Microsoft SQL Server 2012 Performance Tuning Cookbook, a new book and ebook for DBA's that will help them learn about the performance tuning needs for SQL Server 2012 and monitoring the SQL Server performance with Profiler, Execution Plan, and system statistical function. Ritesh Shah : Ritesh Shah is a data professional with more than 10 years of experience in Microsoft technology right from SQL Server 2000. He has sucessfully deployed many medium scale as well as large scale projects using Microsoft technology. Bihag Thaker : Bihag Thaker is an SQL Server enthusiast, an MCTS (SQL Server 2005) and MCITP (SQL Server 2008) who has been working on SQL Server technology for the past few years. He is currently working in the role of a database administrator, and has worked on numerous performance tuning assignments and executed large scale database migrations. This book is divided into three major parts -- Performance Monitoring, Performance Tuning, and Performance Management--that are mandatory to deal with performance in any capacity. Filled with numerous recipes, the first part covers Monitoring with SQL Server Profiler, DTA, System statistical function, SPs with DBCC commands, Resource Monitor & Reliability, and Performance Monitor and Execution Plan. The second part of the book focuses on Execution Plan, Dynamic Management Views, and Dynamic Management Functions, SQL Server Cache and Stored Procedure Recompilations, Indexes, Table and Index Partitioning, Advanced Query tuning with Query Hints and Plan Guide, and Configuring SQL Server for optimization to boost performance. The third and final part provides information on performance management with the help of Policy Based Management and Management with Resource Governor. Packt Enterprise is a publishing division of Packt Publishing designed to serve the information needs of IT Professionals in the Enterprise space. Packt Enterprise also publishes on Microsoft, IBM, Oracle, Citrix, Java, Amazon, Google and SAP technologies.